In order to cook our food, we used a single burner butane stove. We had two pots, plates, bowls, cups, Tupperware containers and cutlery. We also had a couple coolers to store our food. Having a limited amount of supplies to work with we needed to get creative and figure out what worked best. To see what else we brought with us check out our ULTIMATE Packing List for a THREE Month Road Trip for ideas on what to pack for your own trip. If you are planning a longer road trip, like we did, you can also check out How to Plan a LONG Road Trip to get yourself started. Before we left on our road trip we made a huge batch of Jamaican Stew and froze it. We kept it in the cooler and would thaw out a bit at a time for each meal. As time went on it didn't need much thawing. We did the same thing again after stopping for a visit with some family on the way. Here is a breakdown of some of the food that we ate for each meal. We were able to find all of this stuff at major grocery stores and places like Wal-Mart along the way. We weren't eating anything fancy, just stuff that was easy to store and easy to make with the equipment we had. We would buy both items that were perishable like broccoli slaw, vegan hot dog and those that were not like canned soup. If we bought something that was perishable then it would be something we were planning on eating soon whereas the non-perishable items, we would plan on eating later. We were able to buy ice for our coolers but we tended to not do so as much as we thought we would. Most of the time if we bought something that needed refrigeration we would end up eating it soon. 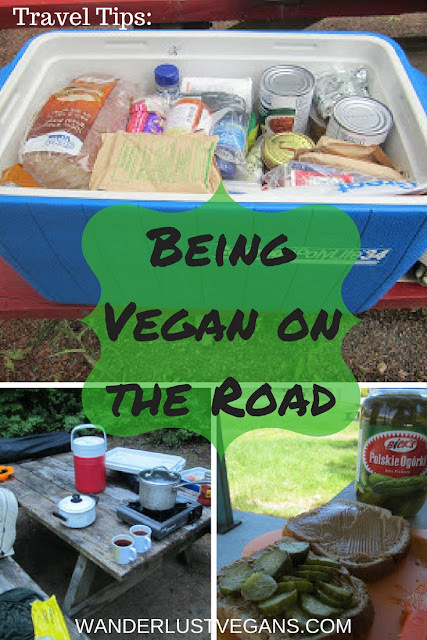 These are some quick and easy vegan options for a road trip or camping trip. You can always find restaurants along the way but it tends to run up the expenses pretty quick. We held out for the amazing vegan restaurants that we found across Canada and self-catered the rest of the time. We hope you liked this list and that it gives you some meal ideas for your next road trip or camping trip. We definitely didn't go hungry and it seems like we saved a lot of money along the way as well. Happy Camping. If you liked this post and found it helpful, please consider sharing it!